In the 1970s, the game of bridge was all the rage. Couples came together with fondue pots and Jell-O molds to deal out hands in living rooms across America. Somewhere along the way, however, bridge fell out of fashion, like the metal-legged wood grain folding tables on which it was played. Socially, the card game has been replaced among younger circles with Bunco, a dice game that requires pure luck and little skill. Poker is also exploding on the card scene, both in play and as a television spectator sport. So, why not simply sit back and let bridge go the way of the console television? 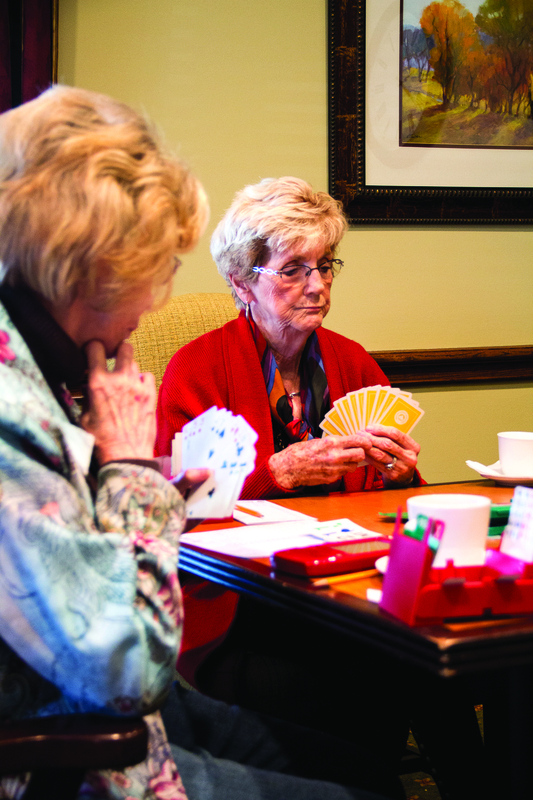 Because, according to several studies, playing bridge can greatly decrease chances of Alzheimer’s and dementia, as well as other age-related conditions. And, as any bridge player can attest, it’s just plain fun. 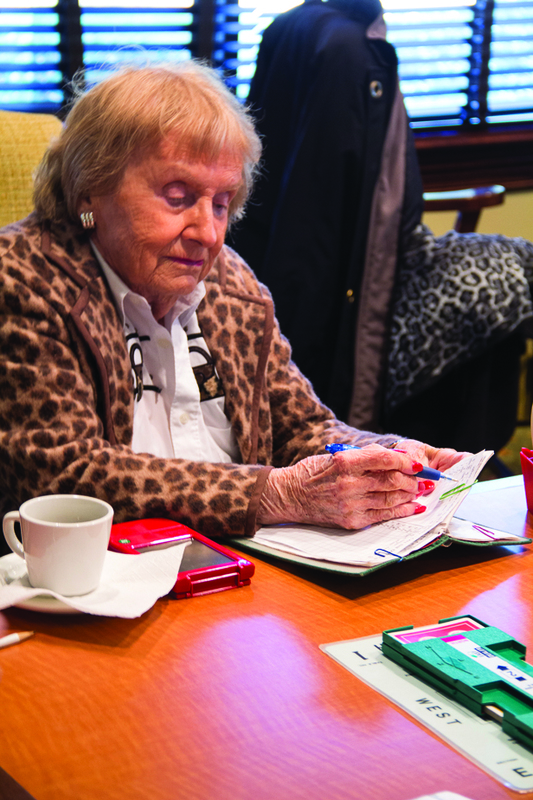 In an effort to save the game, the American Contract Bridge League (ACBL) has launched a campaign to teach the game in schools. The higher level thinking skills involved in bridge have been shown to significantly raise test scores, a phenomenon Fayetteville local Beth Keeney witnessed first-hand while teaching fifth graders at Vanstory Hills Elementary School. Bridge is part math and part strategy, but the game also leaves room for personal style. It’s this unique blend of technique and flair that sets the game apart from the likes of Bunco, poker and even chess. While computers have played against and beat the world’s top chess grandmasters, no program has come close to beating the finest bridge players around. With proponents like Microsoft founder Bill Gates and investor Warren Buffet at the forefront, the movement to save bridge is gaining attention—and funds. Gates and Buffet have personally donated over $1 million to the cause. Keeney runs the Thursday game at Highland Country Club. It’s an ACBL sanctioned game, which means players score masterpoints for their wins. They play duplicate bridge, a variation of the game in which the exact same hands are played by more than one table. Each 52-card deck is shuffled and dealt into four hands of thirteen cards each. Individual hands are placed into four slots on a board labeled with cardinal directions—North, South, East and West. After each game, the hands go back into the same position as the board moves through the room. This system levels the playing field, forcing players to skillfully play the hands they’re dealt. Bridge is as much about partnership as it is about cards. The North/South partners are considered the hosts of the table: it’s South’s responsibility to position the board correctly and North’s job to score the hands, a task that’s gotten easier over the years. “Things have changed so much, but the game itself is the same,” Keeney said. When Keeney first started playing, long sheets were used to keep and calculate final scores—quite a feat considering each person is playing against everyone else in the room. Later, the process changed to where results from paper scoring sheets were manually entered into a computer. Now, wireless scoring systems allow the table score to be immediately sent from handheld devices at each table to the main computer. The system tracks each board and gives results as soon as the last hand is played, so everyone leaves knowing how he or she stacked up against the rest of the room. The Neals went on hiatus from bridge as the kids were growing up and they were playing tennis more often. 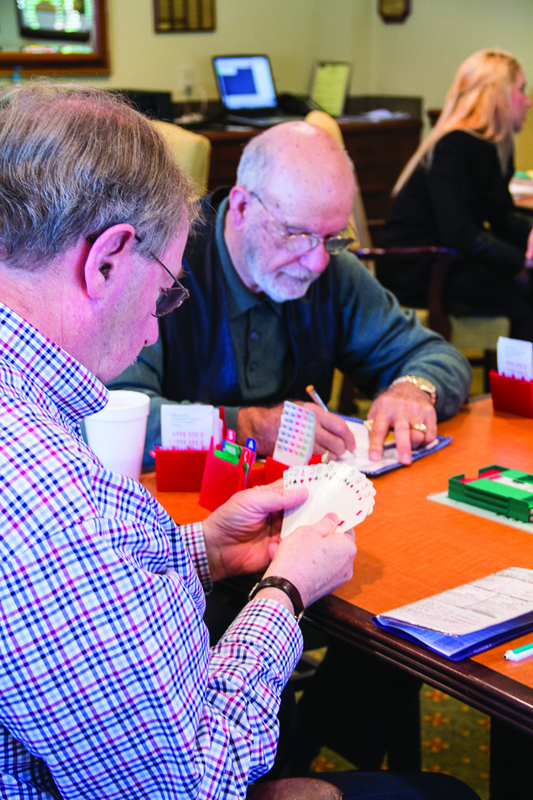 When they got into boating, they started playing bridge when they traveled and the couple quickly rekindled their love of the game. The contract is the result of the sophisticated bidding process at the start of each hand. It’s a complex system of counting cards and communicating with your partner—and the opponents. Once three boards are stacked on each table, time starts and conversation halts. Players pull cards from bidding boxes and place them on the table. With bids such as “one spade” and “two hearts,” it seems simple enough, but each bid describes the point value and suit content of a particular hand. In fact, the bidding and auction systems are so intricate the ACBL requires players to fill out convention cards that explain their bidding style to everyone else at the table. The Neals partner in tournaments and for most of their weekly games. Today, they’re playing with other partners at the Thursday game—one of three weekly games they frequent. Each table moves through the bidding auction in complete silence, like a well-orchestrated dance. After the opening bid is placed on the table, turns move clockwise and players continue to bid until there are three passes showing. The highest bid has won the contract. Now, it’s up to that player to take all the tricks they’ve promised. The partner of the player who won the contract moves into the role of dummy, a silent partner who can’t so much as touch cards without being directed. The opposing team plays defensively, using their skill and strategy to keep the other team from making their contract. Playing the hand requires extreme concentration and recall. “It’s mathematical,” Sue Kimball said. At 93, Kimball holds more ACBL masterpoints than anyone in Fayetteville. She first fell in love with the game when she was in college. It’s that level of cognitive activity that has caught the eye of scientists. Many studies, such as the 2003 Albert Einstein College of Medicine aging study, have linked bridge with an increase of gray matter in the hippocampus of the brain, the area responsible for memory. Kimball plays to keep her mind sharp—and it’s definitely working. As she pulls out the ACBL handbook and recites rules to the other players, it’s clear that she has a knack for recall that people half her age would envy. “You have to be intelligent to play, so it’s a great way to meet pleasant, intelligent people,” Kimball said. Bridge is a civilized game, and the ACBL maintains a zero tolerance policy for rude and unruly behavior. “If someone isn’t pleasant, I call the director over and tattle,” Kimball confided. With only seven minutes of play per board, there’s no time for disruptions. Players quietly move through each board, pulling out cards then bidding, declaring and defending their hands. 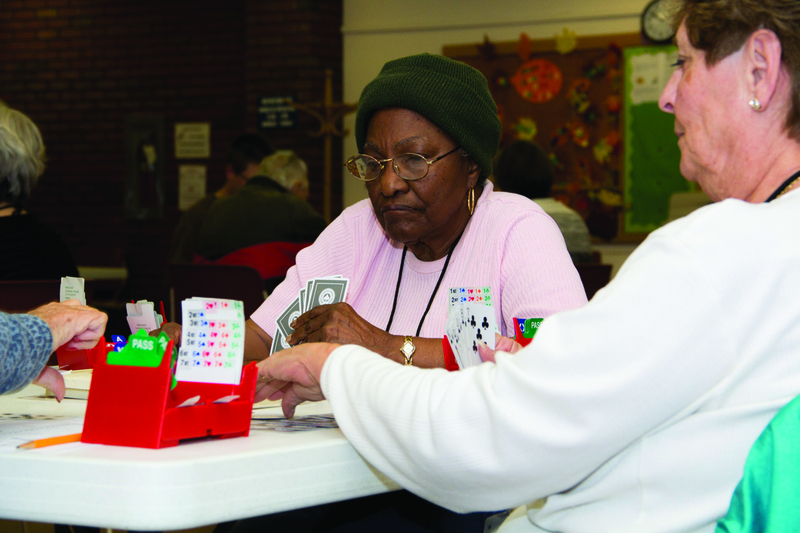 At age 30, Wesley Branch runs the Tuesday afternoon bridge game at the Fayetteville Senior Citizens Center on Blue Street. He took lessons with his mother, Francis Branch, in 2003, and they’ve been playing ever since. They play duplicate bridge at Blue Street, but the game isn’t sanctioned. As players arrive, they drop off their potluck offerings at the buffet table before joining in on the conversations. They’re here to play, but not for the points. Blue Street takes the zero-tolerance policy to the next level, accepting everyone who walks through the doors. They steer first-timers toward lessons, but mostly so players won’t be entirely lost starting out. Wesley learned by reading the bridge column in the newspaper and studying peoples’ hands. The possibilities of play are fascinating to a math and science-oriented brain—probably the attraction for Warren Buffet, who has been widely quoted to say he wouldn’t mind doing jail time as long as his cellmates were decent bridge players. There are precise statistics for calculating the possible hand combinations. In round numbers, it’s around 600 billion, give or take. The Blue Street group keeps paper scores and then Wesley takes them home to tally them up. When he makes his calls on Sunday, he lets each player know how they ranked the week prior. “When there’s a problem, I try to come up with a solution that’s best for all involved,” Wesley says. He makes weekly calls to all of the players and matches them up with partners for the week. In addition to playing bridge, the group looks out for one another, organizing in-home visits to those who can’t get out for medical reasons. “As we get older, we need to exercise our brains. 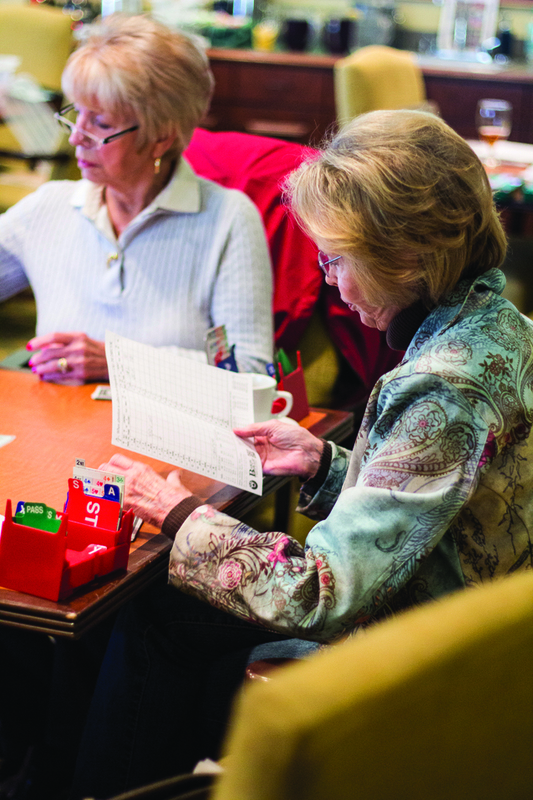 Bridge, crossword puzzles—these things help us,” Lockarney said. As scientists, doctors and the ACBL know, it’s never too early to start safeguarding the brain against the onset of aging. For younger generations, bridge can increase performance now and eventually defend against disease. And, as Bill Gates has pointed out in several interviews, learning the game at a young age means more time to enjoy playing. Lockarney and the Blue Street group consider themselves fortunate to have a young member running their game.